Wine starts in the vineyard. Being passionate about our wines, we meticulously locate the best Pinot Noir and Zinfandel vineyards available. We know only superb vineyard sources allow us to produce the kind of wines we want to drink and share with the world. Years of experience have led to the careful selection of these vineyards. This vineyard is the newest to our lineup. Located near the town of Annapolis on the Northern Sonoma Coast, also known as the "True Sonoma Coast", Campbell Ranch lies right on the fog line at 750 feet above sea level in a very remote area. To visit the vineyard and inspect the grapes, Ben and Dave fly in owner Steve Campbell's private plane. The vineyard is planted with Dijon clones 667 and 777 in low vigor soils. Its location makes it the coolest vineyard in our portfolio We love its unique combination of the soils and climate making this a great new addition to our portfolio of Pinot Noirs. Planted in 2001, the Charles Vineyard is located on an ancient riverbed along Anderson Creek southeast of Booneville in the Anderson Valley. Pinot Noir comprises 10 of the 14 cultivated acres, planted with four different clones—Pommard, 114, 115 and 777. About 15 miles from the chilly Mendocino coast and its foggy breezes, this is one of the coolest microclimate vineyards in the Papapietro Perry portfolio. The Leras Family Vineyards, in the heart of the Russian River Valley off Woolsey Road, is planted with the Pinot Noir Pommard clone, as well as clones 115, 667, and 777. The fruit from this vineyard embodies earthiness and minerals with flavors of cherry, cassis and hints of strawberry. 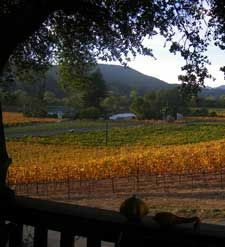 Peters Vineyard, is one of Papapietro Perry’s long-standing vineyards relationships. When we first bought grapes from the vineyard it was owned by Tom Mukaida, a third-generation farmer whom we sadly lost in 2013. Tom began his farming career with apples. In the early 80s, his son-in-law Randy Peters convinced him that there was a future in grapes and encouraged him to convert his orchards into vineyards. An unassuming Japanese-American who was interned during World War II, Tom chose not to have his name on the vineyard. Rather it was named Peters Vineyard for his son-in-law Randy who leased the vineyard from him. Randy’s vineyard expertise, coupled with Tom’s finely honed farming skills and this ideal vineyard location continues to result in exceptional grapes. Our Mukaida Pinot Noir represents ‘the best of the best’ from the Peters Vineyard and was so named to honor Tom Mukaida. This humble unassuming farmer, who through his remarkable cultivation skills on land he loved, produced some of the best Pinot Noir grown anywhere. Thank you Tom, and thank you Randy, for keeping Tom's legacy alive.. Located on the last of Russian River Valley’s alluvial bench with its silty clay loam soil, Nunes Vineyard provides us perfectly ripened grapes vintage after vintage. The valley’s renowned fog is a natural cooling system influencing from two directions, the Pacific Ocean from the west and San Francisco Bay from the south, the perfect condition for a long cool growing season. Fred and Wendy Nunes combine a passion for growing Pinot Noir with a comprehensive knowledge of their vineyard and the science that drives it. The vineyard is divided into ten microclimate blocks and harvested specifically each year for the style of wine we make. Between Mother Nature and the Nunes’, this vineyard has all the components we need to produce stellar Pinot Noir that speaks from the vineyard. Peters Vineyard is located a few miles southwest of Sebastopol on Elphick Road not far from the Sonoma Coast, An ideal location for a Pinot Noir vineyard, this former apple orchard is blanketed by the cool ocean fog in the mornings and evenings, coaxing out the grapes’ best flavors. The hot sunny days intensify the fruit, and create the flavor profile we seek: cherry, black stone fruit and spice. Planted with four clones of Pinot Noir – Pommard, 777, 115, and Wädenswil UCD 2A - the grapes from Peters Vineyard are the foundation of several of our Pinot Noirs.